Calling all actors & writers! It's the last writer's session of the year! LiveShocks is a friendly, laid back reading session where writers can have their work read, actors can have a chance to read some brand new material and directors can listen (for a change). It can be a ground for new writers to gauge their work, for experienced writers to experiment or just a place to meet other people interested in the performing arts. All are welcome! This video was shot and edited by Michael Chen, Founder of WAMM and is a direct result of using Sony Vegas to edit, and is his first edit after receiving a tutorial session from Khairil M.Bahar. Check out the first video which was done before the tutorial here! But, as always, do take note of the main point of this vid, which is to spread the word about MALAYSIAN GIRLS, the musical. The preview was a whole lotta fun. So, be sure to catch the full thing when it takes the stage at Pentas 1, Kuala Lumpur Performing Arts Centre(KLPac). More details at http://kakiseni.com/eventdetails.aspx?id=NzIw or athttp://mgirls.klpac.org . A narrative dealing with a murder or a series of murders and the detection of the criminal; detective story. Terutamanya dalam rumah yang penuh dengan nafsu, pengkhianatan, rahsia dan anggota polis PDRM yang bersungguh-sungguh mencari suspek atau… sesiapa sahaja yang mampu ditangkap… asalkan ada orang kena tangkap. 1925–30: jocular formation from question Who done it?, for standard English Who did it? 2011: “Paku… untuk solve this murder. Kita perlu teliti kesemua-semua klue… klue yang ada… Bodoh!” Assistant Superintendent of Polis Hamzah Mat Noor. Hercule Poirot, Inspector Goole and yes, you too Sherlock Holmes – move over! ASP Hamzah Mat Noor is taking over. A joint operation between Malaysian and Australian theatremakers brings to you a whodunit with a twist. Not only will you be able to compare the plot against such notables as Agatha Christie, Sir Arthur Conan Doyle and J.B. Priestley and show them how Malaysians would have done it; the staging is new and one of a kind, in Malaysia at least. The performance takes place on not one but two stages, simultaneously. Confused, well, so was I at first – but here’s the bottom line, Klue, Doh! unfolds over two separate sets that run simultaneously and literally back-to-back and a moving audience will need to see both performances to be able to piece the puzzles together. The storyline appears to be complemented by clever direction, an accomplished cast and a unique set construction, yeah, remember there are two stages? Yup. Unique. Klue, Doh! the latest collaboration by TerryandTheCuz (Malaysia) and The Rubix Cube (Australia) speaks volumes for imagination and creativity; and it will be exciting to finally see what they have in store for the Malaysian audiences when the show opens this Saturday, December 3rd, at the Black Box @ Publika, Solaris Dutamas. WAMMcast episode 12: NOT a Klue Doh podcast. Honest. This is not a podcast about the upcoming play Klue Doh. No, it's not. It's a podcast about the movie 'China Dolls & Malayan Action Figures, Happy Endings Sold Separately'. That's what this podcast is about. And it features producer TheCuz from TerryandTheCuz, director Alan Jason Parry Allan and actor Martin Blum. This podcast has nothing to do with Klue Doh. It really doesn't. It honestly has nothing to do with the theatre production that's playing from the 2nd till the 17th of December at the Black Box in Publika, Map KL. Honestly, I don't even know why I bring up Klue Doh. These people are talking about a film that needs financing and Australian actors living in the woods and smacking people with appendages that shouldn't be seen in public. Nothing to do with the production at all. None whatsoever. This one's for all you freelancers out there - if you find working at home distracting or want a separate space for you to do your work then Fluent Space is the place for you! Located at the top floor of Kelana Mall, it's definitely a place to check out when working at Starbucks becomes too mainstream. They're also on twitter at @fluentspace so hit 'em up with any questions you may have. We've had quite a few guests back to back on WAMMcast this month, and if you listened to the last episode you'd have heard Khai explain that the reason why there's been so many guest episodes is due to the fact that nothing worth talking about was happening in the local entertainment industry and arts scene. Well, ask and ye shall receive - after what they dubbed to be a slow news month Khai & Amelia are back to wax lyrical about the local scene as they focus their attention to the recent AIM (Anugerah Industri Muzik) and FFM (Festival Filem Malaysia) awards and the controversy that surrounded them this year including the delayed decision to take back Yuna's award for best song, how producer Raja Azmi yelled at the winner of award for best new director and Hikayat Merong Mahawangsa's multiple accolades. The WAMMcast duo also discuss Zee Avi's track on the upcoming 4 disc Dylan tribute album, the recently announced female lead of Vikingdom, Bunohan's recent win at the Taipei Golden Horse Film Festival and the Kampung Radioaktif Project. You'll also hear Khai speak of his love for 'Awas' by KRU. He sure loves that song. And if that's not enough, right after they recorded this episode they sat down with the people from Klue Doh to record episode 12 of WAMMcast... or did they? Find out when we post that episode up tomorrow! So enjoy this week's double dose of WAMMcast and if you've got a comment, drop us a line either in the comments or in the appropriate section of the WAMMcast page! And don't forget - you can subscribe to WAMMcast via iTunes by clicking here so you can get the latest episodes before they're even posted here! Or, if you just want to download it to your computer now, click here (just right click and choose 'save target as...'. Ohbulan! - Trofi lagu terbaik Yuna ditarik balik. Kroni memakan diri? DailyChilli - Meet Vikingdom eye candy! Calling all actors and writers! The folks at EMP want new scripts and they also need actors to come and read those scripts! 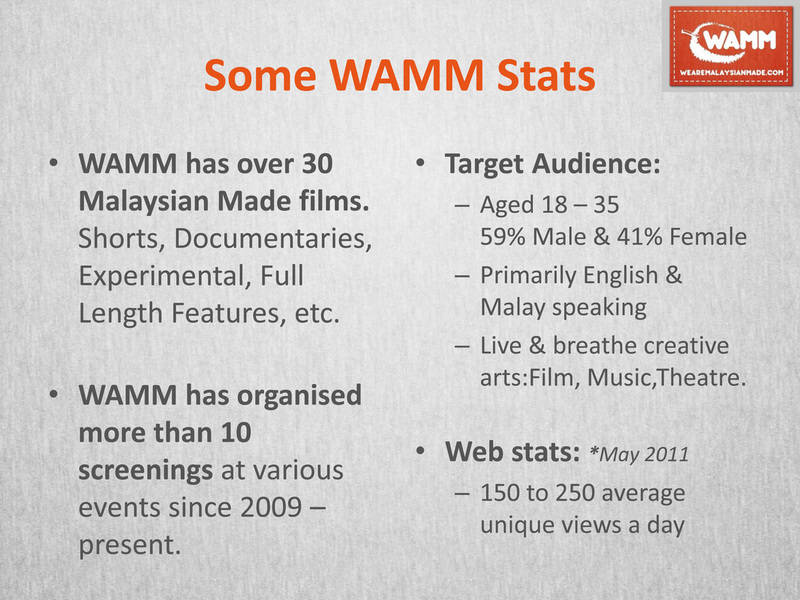 This video was shot and edited by Michael Chen, Founder of WAMM. Evidently, still new at editing, please forgive the amateur-ish upload. 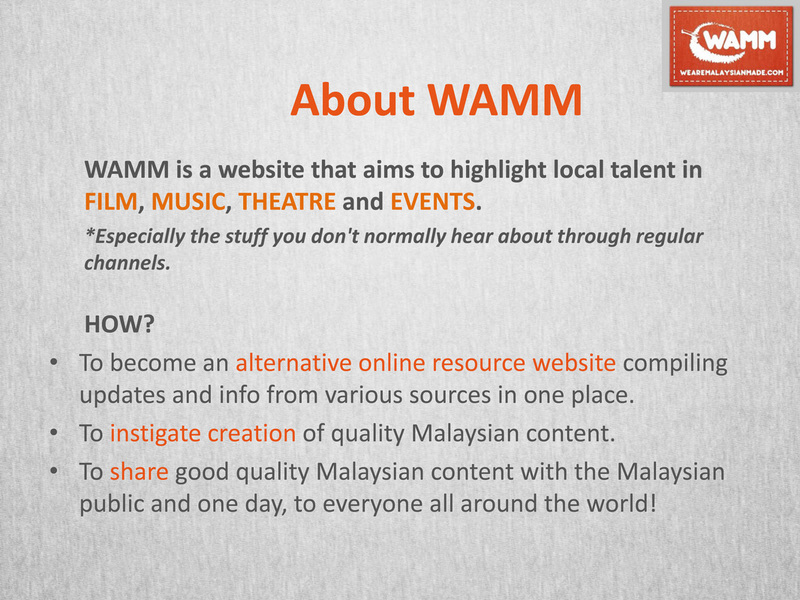 But do take note of the main point of this vid, which is to spread the word about MALAYSIAN GIRLS, the musical. Go get your funny bones tickled! Stand Up Comedians: "If You Think You Funny Please Stand Up", featuring Kuah Jenhan & Malik Taufik (6 Dec)and Phoon Chi Ho & Shamaine Othman (20 Dec). Projek Disko Baldi in "What's Funny This Week?" featuring Redza Minhat, Megat Shahrizal, Shamaine Othman, Iedil Putra & Tuan Faisal! Artificially Intelligent:Improvholics Anonymous (AI:IA) in "Funny Confessions...Shhhh" featuring Malik Taufik, Amelia Chen, Jit Yang, Farah Rani & Ashraf Zain! For all of you aspiring actors and those who want to improve your craft. Here's a workshop for you to take note of! In this class, students will learn a step-by-step approach to script analysis utilizing an American acting technique called Practical Aesthetics. They will also be exposed to the Repetition, an acting exercise that is effective in creating honest and natural performances. The exercise will help students overcome self-consciousness and teach them how to be active in a spontaneous and truthful way. Students will then incorporate these skills into scene work. The class is suitable for those with or without formal acting training. Students will be required to attend every class punctually and be prepared to spend a significant amount of time outside of classes on homework and rehearsals. David Lim is a stage director and an acting teacher. He recently directed God of Carnage at PJ Live Arts and Dancing at Lughnasa at The Actors Studio @ Lot 10. He is also a regular guest teacher at The Actors Studio Academy @ klpac. He trained in acting at the Atlantic Acting School in New York City & also with the faculty of the world renowned Moscow Art Theatre School.